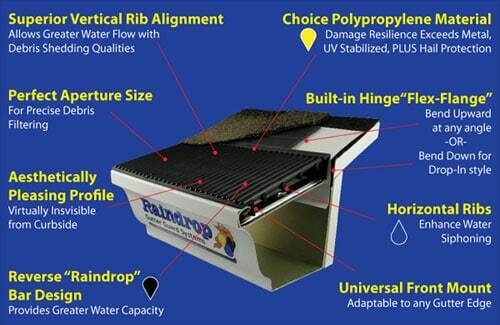 Raindrop offers gutter protection with a self-cleaning design like no other. It handles more rain water than any solid hood cover claims to and is no maintenance compared to micro screens and flat laying gutter guards. Most gutter guards and gutter covers on the market focus on keeping everything out of the gutter. This sounds like a good idea, but in doing so they’re preventing water from flowing into the gutters! “Don’t sweat the small stuff!” The small micro debris like roof grit and dirt doesn’t cause clogs so Raindrop lets it pass through so it can be washed down the downspout with all of the water from the roof. Hood type gutter covers come in all shapes and sizes. We respectfully apologize to our competitors who are reading this, but… no matter what solid hood cover configuration you alter or design, the concept didn’t work originally and it does not work today. During torrential downpours water cascades over the hood and onto the ground around the foundation, causing damage and costing thousands of dollars in repairs. RAINDROP gutter guard handles more water, is more durable, is more adaptable, keeps clog forming debris out, controls ice dams, looks great, and most importantly is budget friendly. Then there is a long list of miscellaneous gutter guard products which com e in all shapes, sizes and materials, It is impossible to review and compare each one. Our advice to anyone looking for a gutter guard system is do your homework and ask questions. A lot of the gutter protection systems on the market promise to keep your gutters clean, and forget to mention that you have replaced that task with cleaning your gutter guards instead. With gutter guards, you need to think of not only what the system does immediately but also what residual effects it will have or cause in the future. Beware of clever marketing and salespeople. Gutter guards are a great idea, they solve and remove so many potential hazards. Raindrop Gutter Guards are without a doubt, a great investment. When you see trees sprouting from your gutters, you know it’s time to clean them out. Gutters overflow when they’re blocked, of course, so your gutters can’t collect the water and guide it safely away from your foundation. 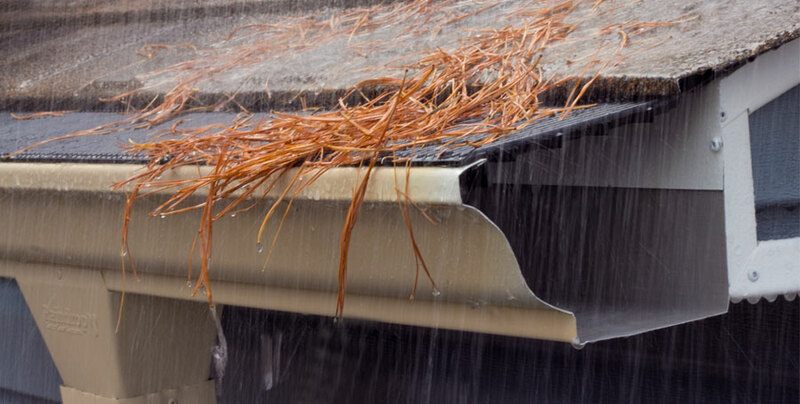 The weight of the debris and the backed-up water can cause gutters to sag, making the problem worse. Ignore the problem long enough and the weight can pull the gutters right off the house.